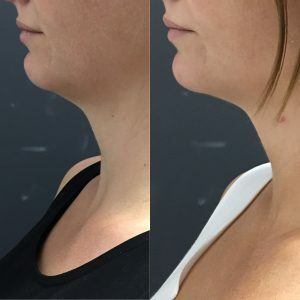 Introduced into Australia in 2018 Aptos threads provide innovation in lifting face and body sagging, body contouring and rejuvenation without surgery. Though new to Australia, they were developed in Europe over a 20 year period and widely used throughout the world. They have 30 threads and over 50 methods for face and body lifting. Using specialised patented threads. Our Doctors are among the first to receive training in the application of APTOS thread techniques. The Korean thread lift has arrived in Australia and we are excited to add it to our thread lift procedures. The Korean face-lift or V Lift uses PDO threads inserted deep into your skin for armouring and to stimulate collagen production. PDO threads help prevent skin sagging and can be used at any age. The peak age for getting these threads is 30 -50. Unlike lifting threads, these threads do not have barbs and are completely absorbable. What Do You Need To Know About A Thread Lift? Thread facelift is one of the fastest growing anti-ageing treatments. With Aptos innovations it is possible to smooth wrinkles, tightening sagging skin with a minimally invasive non-surgical procedure. The procedure of thread lifting involves inserting threads under the skin. These are then pulled to lift the skin. Depending on the technique used thread lifting can restore volume to its rightful place, smooth the surface and improve texture and skin quality. Threads can be absorbable (these dissolve naturally over time) or non-absorbable. Adsorbable threads stimulate the skin to produce more natural collagen and elastin, resulting in long-lasting results. 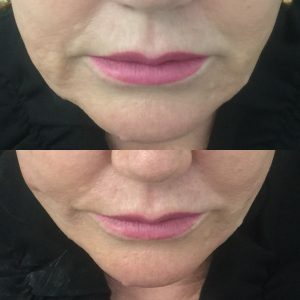 What Can Be Achieved With A Thread Lift? Thread facelifts can be used to restore many ageing facial concerns, including tightening sagging skin, smoothing wrinkles, lift the outer brow. 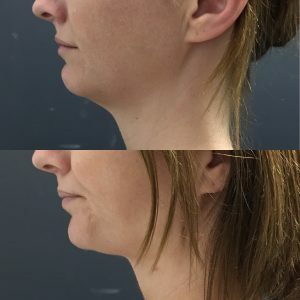 Jawline, neck and body can also be tightened. The results are immediate and last 1.5 to 5 years depending on the composition of the thread. Who Is An Ideal candidate For A Thread Lift? The best candidate is between 35 -55 years of age, though it is not restricted to this. If there is too much loose skin, then surgery may be a better option. Thread lifts can be used to top up facelift procedures after laxity becomes noticeable again. In the meeting, our doctors will go over entirely what you to expect before, during and after the procedure, any possible unwanted effects, what results to expect and any precautions. What can you expect to see after your thread lift? 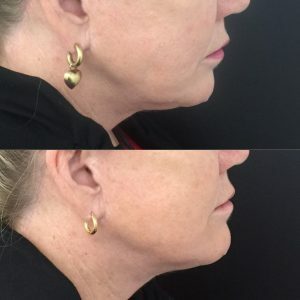 How Does a Thread Facelift Work? The Aptos and PDO thread facelift works in different ways. Both were designed to give an immediate natural lifting effect combined with the progressive restoration of lost collagen. The Aptos threads contain small barbs and provide a more dramatic thread facelift effect than the smooth PDO threads. 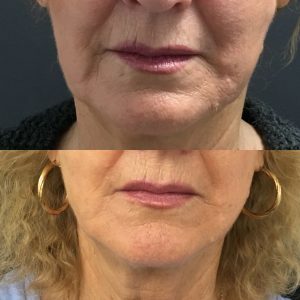 For more pronounced facial sagging the Aptos thread facelift is indicated, whereas PDO threads are used for early sagging or as a preventive measure in younger women. 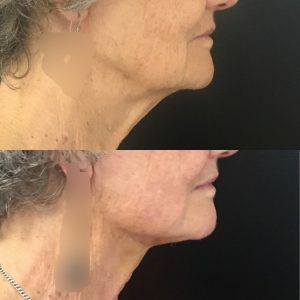 Neither gives results as marked as a facelift, but the procedure is performed under local anaesthetic, takes 30 – 60 minutes, with minimal downtime and effects that last up to two years. The skin threads are made from a special material that works to stimulate collagen growth in your skin. You will notice a progressive and gradual improvement in your skin texture and tone as these dissolvable threads impact. The treatment involves threading of the dissolvable threads under the skin. When pulled upwards, they provide an immediate lift across your face. APTOS threads then stimulate new collagen to be laid down around the threads, replenishing skin tone and a more youthful contour. Dr Shadi will need to assess your face to determine the correct placement for your thread facelift. She offers a free consultation to evaluate if you would benefit from a thread lift, or if another treatment approach would be better. Aptos threads introduced exciting innovations on traditional face threading. 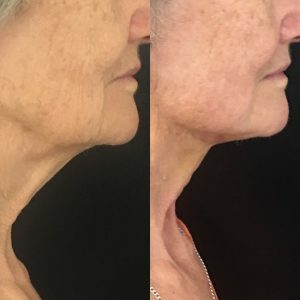 The innovators of Aptos thread lift provide over 30 different threads and 50 methods of the face and body lifting, body contouring and rejuvenation to return a more youthful look and help clients achieve their desired rejuvenation goals without surgery. 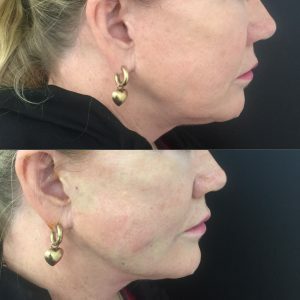 Aptos threads do not merely lift and tightening; they can provide filling and rejuvenation to facial lines and grooves, as well as face and body contouring. How is this achieved? By offering threads in spring or coiled presentation, not merely the linear and barbed of traditional non-surgical threads. There is no surgery and minimal bruising, no scars with the Aptos mini facelift. The absorbable threads break down slowly over time ( about 18 months) and in the process stimulate collagen production. The resulting skin rejuvenation provides long-lasting and natural looking aesthetic results. Expect results to last 3-5 years, depending on the mini facelift technique. Some people will require top-up treatment before this depending on your expectations. Aptos threads utilise a revolutionary approach. As well as lifting and tightening, they can be used for volumising and filling of facial lines. Lip lines and wrinkles, frown lines, marionette lines, lip shaping plus many more areas can be treated. Aptos threads provide face lifting and contouring through use of barbed and spring threads. The Aptos linear thread lift is a non-surgical method for correction of sagging skin. The threads are placed into the soft tissue and left in place. There is an immediate lifting effect with ongoing tissue stimulation to improve skin laxity and quality. Aptos developed the new spring thread, which is placed under the skin using a cannula. This Aptos thread lift provides a more natural rejuvenation. Once the cannula is removed the thread memory makes it possible to lift the corners of the mouth without interfering with facial expression. As the spring is in the thread can move without displacement. Aptos truly revolutionised the application of face threading with their Nano Vitis threads. These threads are twisted pairs without barbs, and when put into place they untwist providing volume for the treated area. These threads are used to treat surface wrinkles and lines, including frown lines and nasolabial lines or grooves and hollows such as tear troughs. Aptos body threads are absorbable threads with barbs for body rejuvenation. They lift sagging body areas and provide an improvement in skin texture and support. The procedure offers ongoing benefit by creating smoother and more elastic skin. 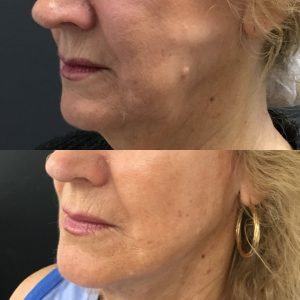 With specialised skin, threads are now possible to correct many nose concerns without surgery, including lifting nasal bridge, lifting nasal tip, asymmetric nostrils and even creating a straighter more defined nose line. A minimally invasive reshaping of the ear from either post-traumatic, postoperative or birth ear deformities. 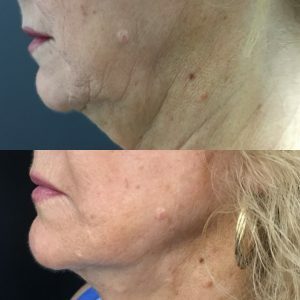 This product is also designed for correction of the chin or increasing cheek volume and can provide longer lasting results for up to 5 years without surgery. The Korean facelift is an entirely different approach to treatment. Originating from Korea, these are non-barbed (floating threads). The principal action is to insert tiny threads into deep in your skin to stimulate collagen. However, because of the nature of the way skin ages, the insertion of threads creates immediate armouring (or scaffolding) effect. And ongoing natural collagen growth. It is recommended as a preventative, collagen stimulating treatment for women and men for sagging across the face, arms, legs and body. What Can The Korean Thread Lift Do For You? The Korean thread facelift provides a dual approach to facial rejuvenation. Firstly by plumping of facial collagen and secondly through armouring facial sagging. The collagen growth helps top up the lost skin volume, for more youthful contours, which the armouring improves uneven jawline and lines and folds across your face. How Long Does Korean Facelift Treatment Take? Although the Korean facelift treatment takes as little as 30 minutes, we ask you to allow 1 1/2 hours. You will need a local anaesthetic applied for up to one hour before treatment, so you are comfortable before the treatment proceeds. Who Is suitable for Korean Threadlift? Face threading is suitable for men and women from age 30 to 70’s. Early facial sagging appears in your 30’s; the extent is genetically determined. But as soon as there is a loss of definition from facial sagging face threading becomes an option to help. It is appealing for people to achieve subtle natural results, rather than very dramatic outcomes of a facelift. What is the downtime with PDO thread lift? PDO face threading requires minimal recovery or downtime. There can be temporary swelling, bruising and tenderness. Dr Shadi will discuss what to expect in your initial free consultation. How long does PDO Thread Facelift Last? The PDO threads break down slowly and the result last one to two years, depending on the degree of collagen stimulation. Is the PDO Thread Lift Safe? PDO threads use a molecule that has been used in medical treatments for years with established safety. Placed into the dermal layer of skin they are well tolerated, with low risk of problems occurring. Are PDO Thread Lifts Painful? Our Doctors numbs the treatment area before treatment commences. There will be some areas that you will feel a sharper area, but we attempt to numb the area thoroughly before we start.